Participants in each session will be divided into four specific topics of increasing importance as we move into the next 15+ years, namely Demographics & Population Change, AI and Automation, The Economic Landscape and Urbanisation. - What are the big shifts or trends we anticipate in the next 15+ years? - How do we see these impacting the public service? - What should we as public servants be doing to prepare? My contribution will be under the topic – AI and Automation with respect to Demographics & Population Changes. Biography: Katina Michael is a Professor in the Faculty of Engineering and Information Sciences at the University of Wollongong, Australia. She is the editor-in-chief of IEEE Technology and Society Magazine and Senior Editor of IEEE Consumer Electronics Magazine. She has been a recipient of telecommunications-centric grants on location services policy, and has been the convener of the annual social implications of national security workshop since the beginning of the series in 2006 with the Research Network for a Secure Australia (RNSA). Katina has consulted for government agencies and defence organisations, such as Prime Minister and Cabinet, Booz Allen, the Commissioner for Law Enforcement Data Security and the Defence Science Technology Office (DSTO). She is a board member of the Australian Privacy Foundation (APF) and has previously been an active member of the Consumer Federation of Australia (CFA) Previously Katina worked for one of the world’s largest telecommunications vendors with secondments throughout Asia and North America. Katina’s PhD was in automatic identification, she has a Masters of Transnational Crime Prevention from the Faculty of Law at UOW, and she completed her Bachelors of IT in the cooperative program at the University of Technology, Sydney with semester employment at Andersen Consulting, and United Technologies. 1943: WW2 triggers fresh thinking. World War Two brought together scientists from many disciplines, including the emerging fields of neuroscience and computing. In Britain, mathematician Alan Turing and neurologist Grey Walter were two of the bright minds who tackled the challenges of intelligent machines. 1950: Science fiction steers the conversation. See Isaac Asimov explain his Three Laws of Robotics to prevent intelligent machines from turning evil. In 1950, I Robot was published – a collection of short stories by science fiction writer Isaac Asimov. 1956: A top-down approach. The term 'artificial intelligence' was coined for a summer conference at Dartmouth University, organised by a young computer scientist, John McCarthy. Top scientists debated how to tackle AI. Some, like influential academic Marvin Minsky, favoured a top-down approach: pre-programming a computer with the rules that govern human behaviour. Others preferred a bottom-up approach, such as neural networks that simulated brain cells and learned new behaviours. Over time Minsky's views dominated, and together with McCarthy he won substantial funding from the US government, who hoped AI might give them the upper hand in the Cold War. 1968: 2001: A Space Odyssey – imagining where AI could lead. Minsky influenced science fiction too. He advised Stanley Kubrick on the film 2001: A Space Odyssey, featuring an intelligent computer, HAL 9000. 1969: A tough problem to crack. AI was lagging far behind the lofty predictions made by advocates like Minsky – something made apparent by Shakey the Robot. Shakey was the first general-purpose mobile robot able to make decisions about its own actions by reasoning about its surroundings. It built a spatial map of what it saw, before moving. But it was painfully slow, even in an area with few obstacles. Each time it nudged forward, Shakey would have to update its map. A moving object in its field of view could easily bewilder it, sometimes stopping it in its tracks for an hour while it planned its next move. 1973: The AI Winter. By the early 1970s AI was in trouble. Millions had been spent, with little to show for it. There was strong criticism from the US Congress and, in 1973, leading mathematician Professor Sir James Lighthill gave a damning health report on the state of AI in the UK. His view was that machines would only ever be capable of an "experienced amateur" level of chess. Common sense reasoning and supposedly simple tasks like face recognition would always be beyond their capability. Funding for the industry was slashed, ushering in what became known as the AI winter. 1981: A solution for big business. The moment that historians pinpoint as the end of the AI winter was when AI's commercial value started to be realised, attracting new investment. The new commercial systems were far less ambitious than early AI. 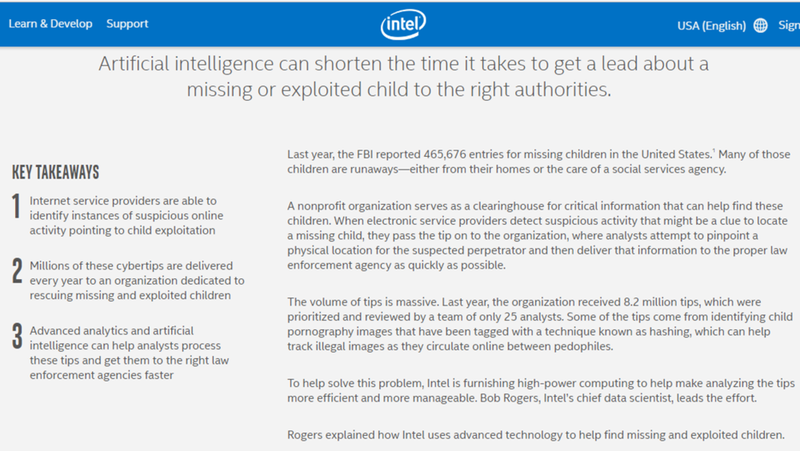 Instead of trying to create a general intelligence, these ‘expert systems’ focused on much narrower tasks. That meant they only needed to be programmed with the rules of a very particular problem. The first successful commercial expert system, known as the RI, began operation at the Digital Equipment Corporation helping configure orders for new computer systems. By 1986 it was saving the company an estimated $40m a year. 1990: Back to nature for bottom-up inspiration. Expert systems couldn't crack the problem of imitating biology. Then AI scientist Rodney Brooks published a new paper: Elephants Don’t Play Chess. Brooks was inspired by advances in neuroscience, which had started to explain the mysteries of human cognition. Vision, for example, needed different 'modules' in the brain to work together to recognise patterns, with no central control. Brooks argued that the top-down approach of pre-programming a computer with the rules of intelligent behaviour was wrong. He helped drive a revival of the bottom-up approach to AI, including the long unfashionable field of neural networks. 1997: Man vs Machine. Supporters of top-down AI still had their champions: supercomputers like Deep Blue, which in 1997 took on world chess champion Garry Kasparov. The IBM-built machine was, on paper, far superior to Kasparov - capable of evaluating up to 200 million positions a second. But could it think strategically? The answer was a resounding yes. The supercomputer won the contest, dubbed 'the brain's last stand', with such flair that Kasparov believed a human being had to be behind the controls. Some hailed this as the moment that AI came of age. But for others, this simply showed brute force at work on a highly specialised problem with clear rules. 2002: The First Robot for the Home. Rodney Brook's spin-off company, iRobot, created the first commercially successful robot for the home – an autonomous vacuum cleaner called Roomba. Cleaning the carpet was a far cry from the early AI pioneers' ambitions. But Roomba was a big achievement. Its few layers of behaviour-generating systems were far simpler than Shakey the Robot's algorithms, and were more like Grey Walter’s robots over half a century before. Despite relatively simple sensors and minimal processing power, the device had enough intelligence to reliably and efficiently clean a home. Roomba ushered in a new era of autonomous robots, focused on specific tasks. 2005. War Machines. Having seen their dreams of AI in the Cold War come to nothing, the US military was now getting back on board with this new approach. They began to invest in autonomous robots. BigDog, made by Boston Dynamics, was one of the first. Built to serve as a robotic pack animal in terrain too rough for conventional vehicles, it has never actually seen active service. iRobot also became a big player in this field. Their bomb disposal robot, PackBot, marries user control with intelligent capabilities such as explosives sniffing. Over 2000 PackBots have been deployed in Iraq and Afghanistan. 2008: Starting to crack the big problems. In November 2008, a small feature appeared on the new Apple iPhone – a Google app with speech recognition. It seemed simple. But this heralded a major breakthrough. Despite speech recognition being one of AI's key goals, decades of investment had never lifted it above 80% accuracy. Google pioneered a new approach: thousands of powerful computers, running parallel neural networks, learning to spot patterns in the vast volumes of data streaming in from Google's many users. At first it was still fairly inaccurate but, after years of learning and improvements, Google now claims it is 92% accurate. 2010: Dance Bots. At the same time as massive mainframes were changing the way AI was done, new technology meant smaller computers could also pack a bigger punch. These new computers enabled humanoid robots, like the NAO robot, which could do things predecessors like Shakey had found almost impossible. 2011: Man vs Machine (Watson). In 2011, IBM's Watson took on the human brain on US quiz show Jeopardy. This was a far greater challenge for the machine than chess. Watson had to answer riddles and complex questions. Its makers used a myriad of AI techniques, including neural networks, and trained the machine for more than three years to recognise patterns in questions and answers. Watson trounced its opposition – the two best performers of all time on the show. The victory went viral and was hailed as a triumph for AI. 2014: Are machines intelligent now? Sixty-four years after Turing published his idea of a test that would prove machine intelligence, a chatbot called Eugene Goostman finally passed. But very few AI experts saw this a watershed moment. Eugene Goostman was seen as 'taught for the test', using tricks to fool the judges. It was other developments in 2014 that really showed how far AI had come in 70 years. From Google's billion dollar investment in driverless cars, to Skype's launch of real-time voice translation, intelligent machines were now becoming an everyday reality that would change all of our lives. "Computers have been over-sold. Understandably enough as they are very big business indeed. It's common knowledge that some firms bought computers in the expectation of benefits which failed to materialise. My concern tonight however is with the over-selling of the longer term future of computers. The scientific community has a heavy responsibility to put forward the facts to avoid the public being seriously mislead. Just as the US National Academy of Sciences did in 1966 when it reported that enormous sums of money had been spent on the aim of language translation by computer with very little useful result, a conclusion not subsequently shaken. Failures continually occurred also in computer recognition of human speech, or handwritten letters and in automatic proving of theorems in higher mathematics." It is amazing to watch a professional game of chess. The first moves happen so quickly that the human eye watching can barely keep up and 'compute' mentally. A sure visualisation of a computer making a move metaphorically would see every possible future step played out before moving within a few split seconds if not less, impossible to denote via the naked eye. Kasparov says: "...you said is it for better or worse? It's happening period. The technology is neither good nor bad, it's agnostic. You know you can do many great things with your mobile phone but you can also create a terrorist network so it says it's happening and we just have to adjust." "[Context: Human and computer vs machine]. I can tell you the quality was not very high because it was limited amount of time and it was so new for us how to use the machine. Eventually I realized- we had many events the so-called freestyle events on the internet that proved, and it could sound quite ironic but you don't need a very strong player to get the best result of human plus machine combination. It could sound like a heresy now but I would say that you don't want a strong player it's you need a good operator ignition, and a decent player." Who is partnership AI? And who are their partners? It turns out that many AI researchers and AI pundits, especially those pessimists who indulge in predictions about AI getting out of control and killing people, are similarly imagination-challenged. 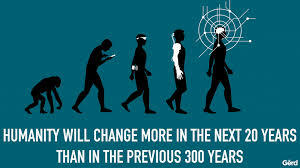 They ignore the fact that if we are able to eventually build such smart devices, the world will have changed significantly by then. We will not suddenly be surprised by the existence of such super-intelligences. While such results promise to provide great value, we need to be sensitive to the possibility that there are hidden assumptions and biases in data, and therefore in the systems built from that data. This can lead to actions and recommendations that replicate those biases, and suffer from serious blindspots. Discussions are rising on the best approaches to minimizing potential disruptions, making sure that the fruits of AI advances are widely shared and competition and innovation is encouraged and not stifled. We seek to study and understand best paths forward, and play a role in this discussion. AI offers great potential for promoting the public good, for example in the realms of education, housing, public health, and sustainability. We see great value in collaborating with public and private organizations, including academia, scientific societies, NGOs, social entrepreneurs, and interested private citizens to promote discussions and catalyze efforts to address society’s most pressing challenges. Some of these projects may address deep societal challenges and will be moonshots – ambitious big bets that could have far-reaching impacts. Others may be creative ideas that could quickly produce positive results by harnessing AI advances. Over the next five years, this project will study the impact that genetics, environmental factors, daily habits and the human microbiome have on the cognition of older adults. This collaborative research initiative will also use artificial intelligence (AI) systems to comb through massive amounts of data with the goal of promoting healthier living. We want caring for the older population to be not just palliative, but preventive. Rather than treating serious cognitive decline, we seek ways to stop it. Lower prices, which makes its products more appealing and creates an increased demand that may lead to the need for more workers. Generate more profit or pay higher wages. That may lead to increased investment or increased consumption, which can also lead to more production, and thus, more employment. Amazon offers a more modern example of this phenomena. The company has over the last three years increased the number of robots working in its warehouses from 1,400 to 45,000. Over the same period, the rate at which it hires workers hasn’t changed. In 2013, researchers at Oxford sparked fear of the robot revolution when they estimated that almost half of US occupations were likely to be automated. But three years later, McKinsey arrived at a very different number. After analyzing 830 occupations, it concluded that just 5% of them could be completely automated. The two studies obviously counted differently. The Oxford researchers assessed the probability that occupations would be fully automated within a decade or two. 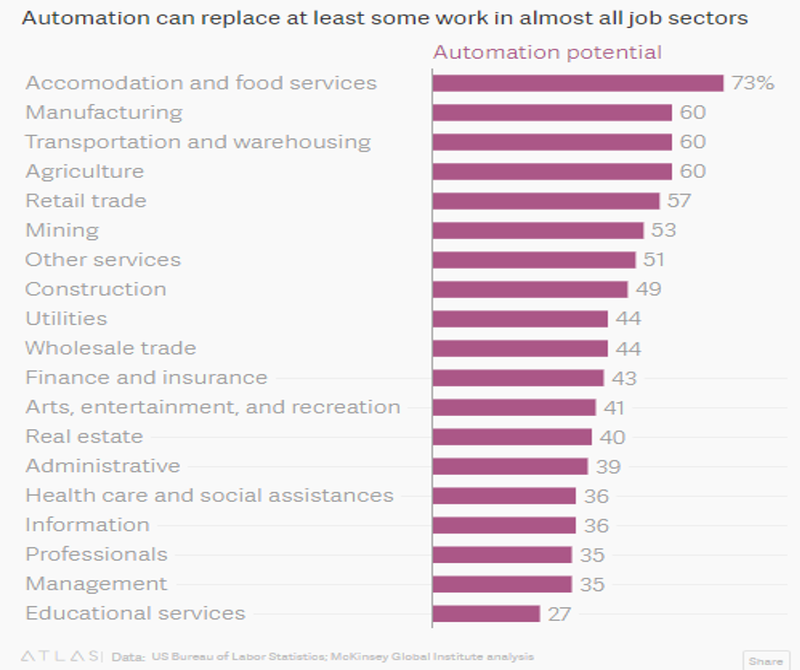 But automation is more likely to replace part of a job than an entire job. When Amazon installs warehouse robots, they currently don’t replace full workers, but rather, the part of the job that involves fetching products from different shelves. Similarly, when my colleague used artificial intelligence to transcribe an interview, we didn’t fire him; he just worked on the other parts of his job. McKinsey’s researchers’ model didn’t attempt to sort jobs into “replaceable” and “not replaceable,” but rather to place them on a spectrum of automation potential. The prevailing world depression, the enormous anomaly of unemployment in a world full of wants, the disastrous mistakes we have made, blind us to what is going on under the surface to the true interpretation, of the trend of things. For I predict that both of the two opposed errors of pessimism which now make so much noise in the world will be proved wrong in our own time-the pessimism of the revolutionaries who think that things are so bad that nothing can save us but violent change, and the pessimism of the reactionaries who consider the balance of our economic and social life so precarious that we must risk no experiments. Caption: So what's it going to be? Freedom or enslavement? Or more of the same old same old? Important work being carried out at IEEE Global Initiative on Ethics of Autonomous and Intelligent Systems. More recent new standards projects in this space can be found here. A comprehensive discussion document for Ethically-Aligned Design can be found here. An exceedingly optimistic view of, and predication for, AI. The potential bad results for/from AI are just as great as the potential benefits. It all depends upon how the AI is engineered, implemented, and TESTED before implementation (I capitalized because I've seen a trend in the past 15 years for software and systems to NOT be tested enough before being put into production). • What ethical computing rules will be required and followed when creating these AI applications, systems and networks? Will ethical computing rules even be considered? Etc. • What types of security (data and physical) controls and rules will be implemented? Will there be any? Will they be appropriate? Adequate? Etc. • What types of privacy controls and rules will be implemented? How will they be determined? Will they truly support privacy? Etc.